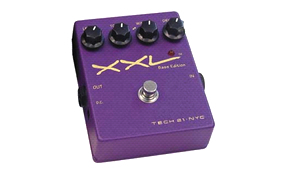 KitMonsters – Tech 21 XXL Bass Pedal. The music makers’ guide to making music. Originally a guitar distortion pedal, such was the response from bass players that they released a bass version. The distortion available with this pedal is enormous, creating some monster tones. The Warp setting uses the dynamics of your playing to create the sound, meaning you can achieve different tones even with the same setting depending on how hard you hit the string. The controls are straightforward, with Warp, Level, Drive and Tone, you can manipulate your sound across a range of very different styles. For DI purposes, this works well with a SansAmp pedal, and can give you that extra distortion that otherwise would be unavailable. Paired with an amp, it can make you growl and roar in a way that amps generally can’t do on their own.